The Protagonist: Todd Prewitt. A boy on the verge of manhood, he lives in an all-male settlement where everyone's thoughts are audible to everyone else, an endless Noise. His Angst: When Todd finds an unexpected spot of quiet in the Noise - and discovers that spot corresponds with a person, a girl, he and the mysterious female are forced to flee every truth he's ever known. The Other Protagonist: Viola. A space colonist orphaned in a crash-landing, she discovers the new planet and its settlers aren't the paradise she expected. Her Angst: Her gender and her immigrant status make her a target for the same people hunting Todd. The Word: I'm usually a literal reader. I expect plots to make objective sense and I prefer characters who act in believable human ways, rather than as puppets for some larger artistic message or theme. It's the reason I've never really enjoyed Don DeLillo or Thomas Pynchon, where the characters are more symbolic than tangible. 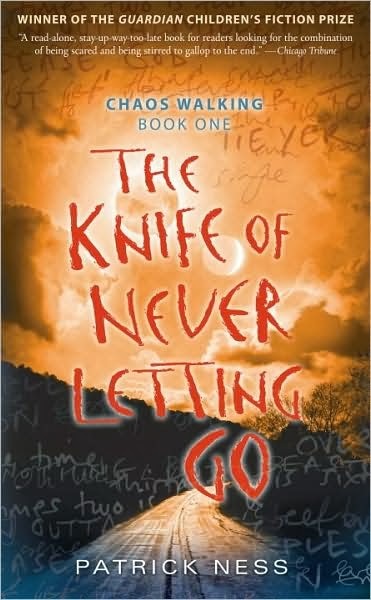 However, I really enjoyed The Knife of Never Letting Go, despite the fact that the core concept of the series is blatantly implausible and the story is a minefield of plot holes. When read literally. When read allegorically, however, it's a fascinating character study with truly empathetic characters, breakneck pacing, and satisfying tension. A bit like Pilgrim's Progress in space. Todd Prewitt lives in a cursed, dreary hamlet known as Prentisstown. A long time ago, aliens known as Spackles dropped a germ on the human settlers that killed all the women and forced every man's thoughts out into the open. Every man's thoughts became audible to everyone else, coalescing into a constant, cacophonous Noise that the miserable inhabitants of Prentisstown have had to live with all this time. However, while walking his dog, Manchee (whose thoughts are also audible - he's bit like Dug from Up), Todd comes across a spot of complete silence - an island of quiet in the sea of Noise. When his adoptive parents, Ben and Cillian, read his discovery in his thoughts, the horrified pair pack him a bag and order him to flee Prentisstown before it's too late. Prentisstown, it appears, has managed to hide a fair number of dangerous secrets despite the open book of everyone's thoughts and Todd's discovery of the Quiet makes him a target for Prentisstown's sinister mayor, Prentiss, as well as Aaron, Prentisstown's insane preacher. Todd discovers one of these secrets when he tracks down the Quiet and discovers it's a person. A girl. A girl whose thoughts he can't read at all. Todd and the girl, Viola, race towards Haven - a larger settlement that promises safety - all the while learning just how much history the men of Prentisstown have rewritten for their own benefit. The Knife of Never Letting Go paints a fascinating picture of what it would be like to have absolutely no privacy, and how that affects and distorts personal morality. Being able to hear everyone's thoughts with no way to turn them off. Scratch that - to be able to hear all men's thoughts. As Todd and Viola discover - women don't produce Noise. Todd and Viola soon encounter other settlements whose inhabitants have come up with different ways to deal with the Noise and this new difference between men and women. The novel gallops along at an addictive, breakneck clip, using Todd's stream-of-consciousness narration to pull you deeper into the story. And Todd is such an empathetic character. He's believed everything he's been told, he's been force-fed a certain idea of right and wrong, and then suddenly he's set adrift and has to make those decisions for himself. We, the reader, are put in the same position as Viola. We get to "read" all of his thoughts, all of his questions and observations about the world. As readers, we're used to this level of intimacy with a protagonist's thoughts, but when framed by the concept that every other character in the novel experiences this as well, it brings home how terrifying and bizarre it would really be to have complete access to another person's mind. While talking about this during the February meeting of the Forever Young Adult Book Club, my FYA friend Mandy pointed out how the novel serves as a cunning metaphor for the age of social media. So many people are willing to spill every detail of their lives on Twitter, Facebook, Tumblr, and Vine, even when these instances of TMI can come back to haunt them years later. And as more and more interactions take place online, it's grown increasingly difficult for people to keep secrets in the electronic age, particularly if they're a prominent or famous person. That being said, the novel's not perfect. There are lots of plot holes - there's really no explanation for how Todd never heard the town's secrets in their Noise over the years. As well, the novel's main antagonist, preacher Aaron, is a superficially evil whack-a-mole villain with zero motivation who pops up at random moments to move the plot. But damn if I don't want to keep reading and find out what happens next! Oh wow, you make me sound smarter than I am haha. And looking back on the book and our convo of it, I think there should be a Show Your Cards/Fill Your Plot Holes Earlier label for series books. Obvs, that hasn't been a real obstacle for me, with this book (or the Divergent series, like we talked about), but the Dangle-y Lost Technique can only do so much if the reader isn't engaged enough to see a series through to the end.